For those of us who have been in the business of supplying the oil and gas industry with ASME pressure vessels, welding, and skid packages we all know the “feast or famine” cliche all too well. It seems that the feast may be building as well head projects have now turned to midstream to begin production. After 30 years of the ups and downs in the gas business I’m not surprised to be seeing another dramatic upswing in the demand for process equipment like columns, separators, slug catchers, pots and pans pressure vessels, and compression. As oil has been settled around $100 a barrel, NGL’s (Natural Gas Liquids) are worth a premium! What the general public doesn’t know is that the gas boom isn’t really about the methane gas (although changes in public and government sentiment around using coal to produce power is also driving the boom) but it has far more to do with the NGL’s that need to be separated from the natural gas streams. In the 1980’s we built a good business by providing comparably smaller size Natural Gas plants to individual producers that were running between 50k scf/d and 25mm scf/d. However, the days of small natural gas producers seem to be facing an einvitiable end. 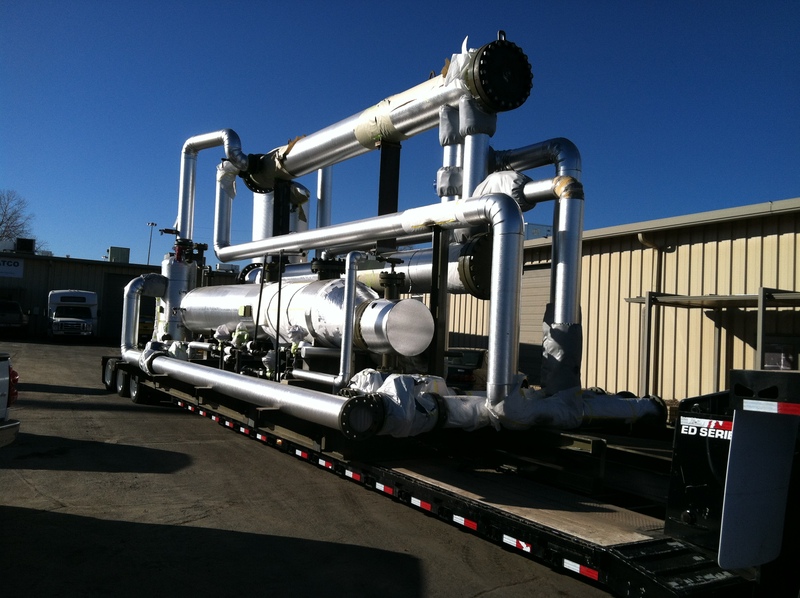 Although, we still build an occasional NGL plant (JT or Refrigeration) it seems that large large single components like re-boilers, separators, columns, towers, and random pressure vessels or heat exchangers are getting much larger in size to handle large scale centralized natural gas processing facilities. The days of building an entire skid package so a small producer can sell into the pipeline has given way to being a vendor that supplies parts and pieces to a large scale facility. Currently, we have have on order several towers that have various packing requirements that are all in excess of 4′ X 80′. We are also building catalytic reactors for the removal of oxygen, slug catches, pulsation bottles, and other various components. These vessels range in size a weight between a few hundred pounds all the way up 40,000 lbs. However, the commonality is that it is all for gas production throughout the USA. This years business activity in gas processing is a stark contrast to last year when we did less than 25% of our business with oil and gas projects. I welcome the feast as we have always enjoyed working with clients in the Oil and Gas industry. Like always, Precision Pipe and Vessel is working very hard to meet tight deadlines and get these components into the field in record time.